Alligator is a classic protein around Louisiana and for good reason. The lean white meat has plenty of flavor, plus it can be a lot of fun to feast on an animal that could just as easily feast on us. 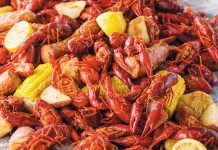 Although we’ve witnessed the rapid rise of Swamp People (its seventh season starts in February), alligator dishes remain popular. There’s really no limit to what you can do with alligator meat. Golden-fried nuggets of well-seasoned alligator are fun to pop in your mouth, while a tender alligator sauce piquant works well at a large gathering of family and friends. For the adventurous, the Ready Portion Meat Company makes alligator and beef hamburger patties. And, of course, there’s the all-time favorite: blackened alligator. Blackening is a method of cooking made famous by the late and legendary Louisiana chef, Paul Prudhomme. 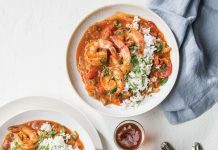 The culinary tactic involves a screaming hot black cast-iron skillet and a blend of spices and seasonings to create a crust around a protein, redfish in Chef Prudhomme’s case. 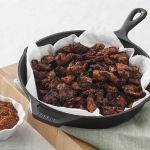 Blackened alligator is a delicacy, as long as you make sure to cook the meat quickly so it doesn’t dry out. As always when blackening, don’t be afraid to get your pan extremely hot. Make sure you do it in a well-ventilated kitchen, or even outside, as it creates a fair amount of smoke if you’re doing it right. Most importantly, get ready to please your taste buds and impress your friends. Place a large cast-iron skillet over high heat until very hot, about 7 minutes. In a large bowl, add alligator meat, and toss with Jay’s Blackening Mix. Add canola oil to the skillet, and carefully add alligator in batches. Let cook until meat is blackened and releases easily, 2 to 3 minutes. When it releases, turn each piece, and cook 1 to 2 minutes more. Remove alligator from the skillet, and serve hot with white rémoulade. In a medium bowl, combine all ingredients. Store covered for up to 1 year. You better season the hell out of that gater, otherwise you won’t be able to get a 2nd bite down. This actually is probably over-spiced. Some Prudhomme’s Blackening Magic and a little Slap Ya Mamma for a bit of spiciness works nicely. Remoulade may be nice (like with anything); but a good whisked and frothy white wine, butter, and garlic reduction sauce for dipping is also killer. Thanks for your comment, Colin. 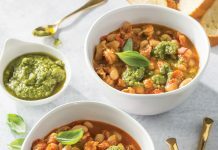 Our Test Kitchen thoroughly tested this recipe and did not find it over-salted or over-spiced. Those two spice mixes you mentioned are certainly delicious, though. C’est bon, editor 🙂 My comment was more in reply to Tim’s “gotta season the h3ll outta that gater!”. But I do typically reserve Ancho chilis for my chili and tamales,etc. I love making Texas Red competition chili, and anything beyond spicy. Chef Pauls blackening Magic is just awesome, but mostly due to the lavender. It adds this subtle overhead flavor that makes meat beg for a bearnaise sauce. A good breakdown recipe for blackening seasoning a little spicier can be found if you google the Chicago Chop House Blackened Steak Salad. A short class I took with Chef Phil O’Donnell on the North Shore LA area, he demonstrated very clearly how seafood can be blackened perfectly with nothing but the correct smoke temperature oil, freshly cracked black pepper, and kosher salt. Tiny bit of cayenne, and some white pepper.